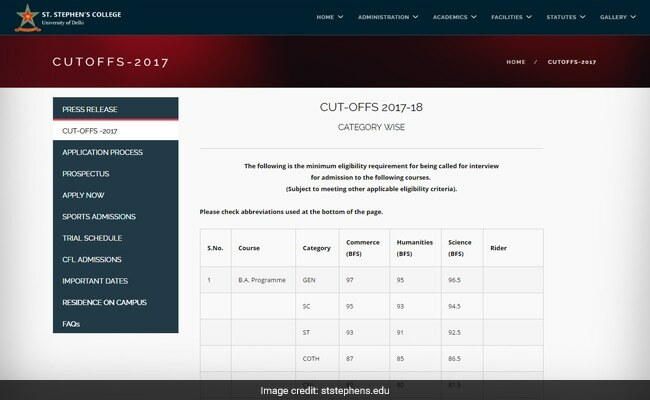 Delhi University's St Stephen's College has released the first cut-off list for 11 courses: Economics, English, History, Philosophy, Sanskrit, Mathematics, Chemistry, Physics, BA programme, BSc programme (physical sciences) and BSc programme (computer sciences). New Delhi: Delhi University's St Stephen's College has released the first cut-off list today for admission to various undergraduate courses for the academic year 2017-18. English and Economic courses witnessed the highest cut-off at 98.5 per cent for general (non-Christian) category candidates. The college had earlier announced that it would announce the cut-offs by yesterday midnight, but later postponed it to today. Take a look at all cut-offs on the St Stephen's College official website. As compared to last year, the cut-off for English Course has gone down by 0.5 per cent. However, the economics course cut-off is up by 0.3 per cent. History course also witnessed a dip in cut-off marks from all streams. According to a release from St Stephen's College, a total of 24,168 applications were received for the 410 seats in 11 courses this year. The list of candidates selected for the aptitude test and interview will be displayed tomorrow on the official website with formal interviews beginning on June 17. The first meeting and registration will take place on July 19. The college will also declare a schedule for candidates applying for sports-based merit admissions. Person with disability or PwD category candidates do not need to appear for the aptitude test. Instead, their interview will hold a weightage of 15%. The college reserves 50% seats for Christian candidates. It also conducts an aptitude test, followed by a personal interview for applicants fulfilling the eligibility criteria and cut-off marks. St Stephen's College offers honours courses in Economics, English, History, Philosophy, Sanskrit, Mathematics, Chemistry, Physics, BA programme, BSc programme (physical sciences) and BSc programme (computer sciences).